Janine: We have never been to WDW in the fall. We have been to the US in both October and November, but these were city breaks to New England. They were amazing trips in their own right (including our honeymoon in 2004) but I have a yearning to see WDW at this time and attend MNSSHP. The fall is one of my favourite times of year and I especially love October, so much so it was the month we chose to marry in, so it is now even more important. I also adore Halloween and have always embraced the holiday, even when it wasn't really a big occasion in the UK. It has become far more commercial in the last ten years or so and trick or treating has now become the norm. Back when I was growing up in the eighties, I would get the door slammed in my face with people saying it was a silly American tradition that would never catch on. Ha, is all I can say now, and I look forward to taking Tink when she is a little older. So, how do I embrace the season here in the UK and bring a little Disney to the dark and dismal Autumn months? Well firstly, I decorate. 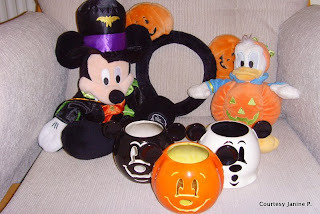 For a week or sometimes more before Halloween I bring out my favourite spooky ornaments, mainly all from the US, with the best being my Mickey tea light holders, they are AWESOME!!! I always carve a Jack O Lantern too, and last year managed to proudly carve a silhouette of a Mickey head. This year I have an awesome pumpkin crisp recipie that Amy has kindly sent me to try with the insides too, yummy. I also have a vast assortment of Disney plushes, including a vampire Mickey, a pumpkin Donald, a witch Eeyore and a pumpkin Pooh Bear. I bring out my Pumpkin Spice Yankee Candles (oh how jealous I am that you have this flavour in Starbucks in the US, we don't even have cinnamon over here, *sobs*) and drink my pumpkin coffee that friends have kindly sent me in the post. I am usually glued to the Disney Channel too this time of year as I adore the movies, my favourites being Hocus Pocus and Halloween Town. I also love the themed episodes of the shows, I really am a big kid at heart! And on the 31st itself, we get a huge tub of sweets, dress Tink up in a witches outfit, light the candles and the pumpkins and wait for the trick or treaters. Before we had Tink, Steve and I would then go off to the cinema and watch a scary film, these days a DVD suffices, or if I get my way, a Disney channel original movie. Natalie: Fall is my favorite time of the year. Perhaps it is the fact that the leaves of the trees turn green, red and orange, the same colors used in the kitchen of my childhood. Or perhaps it is the change in temperatures, easing everyone from their hot, long summer days. Maybe it is the fact that October brings along my birthday celebration fun. Whatever the reason for finding the fall to be my favorite time of year, I most look forward to celebrating the fall in the Disney parks! Visiting at this time of year offers guests temperatures that are much more mild. Most schools are in service leaving guests to enjoy shorter lines and more time for additional attractions. This year, I will be visiting Disney during their Mickey’s Not So Scary Halloween Party. This is a party that takes place in the Magic Kingdom on many nights in September and October. Guests must purchase a separate ticket for this event, leaving the park to be less crowded. When visiting, you will notice that guests of all ages dress up in costume. Being dressed up in costume really makes the experience of trick-or-treating that much more fun! Be sure to take along a camera to capture the details of the Boo to You parade! In addition to attending the party, I look forward to wearing the birthday button! Wearing the birthday button always bring a few extra birthday wishes and sometimes even a few birthday treats. And as if all this was not enough, the fall brings about EPCOT’s Food and Wine Festival. Here you are able to sample small portions of foods and wines from around the world throughout the World Showcase. At each of the food stands, the menus present the food available with details of the ingredients and the wines (or beers) that best pairs. I love being able to try a variety of foods and wines for a much smaller price and portion size than if I purchased an entire dish of the same food. If you have never been to Walt Disney World in the fall, be sure to plan your vacation soon so you can experience all of the fun. If you plan on being there this year, I hope to see you the second weekend in October during the Sorcerer Radio meet. I, along with the other DJs, are excited to meet up with other Disney fans. Hope to see you there! Thanks to our regular contributor, Janine, and Natalie from Meet the Magic for today's celebration of Disney in the fall. Be sure to check back with us as the rest of the Minnie Moms share what Disney means to them this time of year. There are some wonderful photos and stories coming your way. Please visit the Minnie Moms page for past articles and more information about these fabulous ladies. 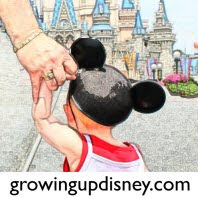 Really great post, I agree Fall is a great time to visit WDW, there is so much fun stuff. 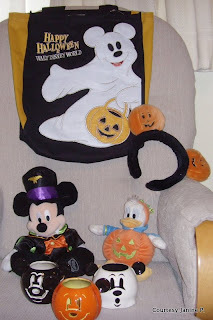 I love all the Mickey Halloween stuff too.